Guess How Many Engines SpaceX's Giant Falcon Heavy Rocket Has? SpaceX conducted a static fire test of its megarocket, the Falcon Heavy, on Wednesday. SpaceX tested a giant rocket it says will be the "most powerful operational rocket in the world" — and it went pretty well. 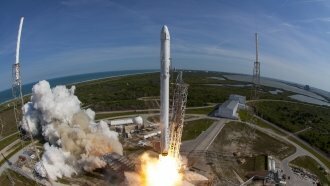 SpaceX conducted the static fire test Wednesday at NASA's Kennedy Space Center in Florida. The megarocket's 27 engines flared up at full power while the rocket stayed anchored to the launch pad. This is just one step of many before the Falcon Heavy lifts off for real, and outlets report it's been a struggle to get even this far due to various setbacks. SpaceX hasn't announced a concrete launch date, but CEO Elon Musk suggested the rocket could be ready in about a week.